Quilting Arts TV Series 1600 is here! 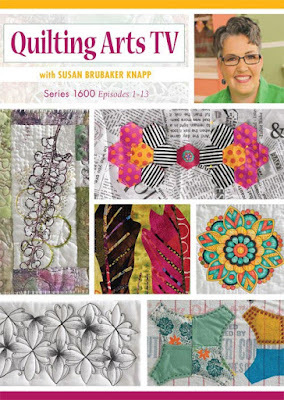 “Quilting Arts TV” Series 1600 is here! We have some terrific guests in this series; if you’d like to see and read more about them, you can get the inside scoop on my previous post here. These shows will start airing on about 400 Public Television stations in the U.S. soon. Not all stations carry the new shows at the same time, so depending on where you live, you might see the new shows in July, or you might see them later this year. A note about the projects on QATV: Through series 1400, most of the projects featured on QATV were offered as free downloads. For Series 1500, the projects were available in a booklet for $14.99. For Series 1600, in response to customer comments, F+W Media, the parent company of Quilting Arts, will be offering some of the projects for free, some in Quilting Arts magazine, and some as more affordable individual downloads ($4 each). The company made the change toward charging for this content in an attempt to offset the rising costs of producing the show, which is available free to consumers (without the advertising on regular TV) on public television. 1601: Design and Stitch - Join Pat Pauly as she shows you how to add a linear quality to quilt designs with pieced thin lines. Then, explore how to design a double-sided quilt with two different points of view with Nysha Oren Nelson. 1602: Take it Slow - Watch as Lynn Krawczyk explores artful wool felt color studies with hand stitching. Then, let Mark Lipinski explain the philosophy of the Slow Stitching Movement. 1603: Beads and Sequins - First, Catherine Redford demonstrates a fancy beaded edge technique. Then, Jane LaFazio uses beads and sequins to make small works of art. And Susan Brubaker Knapp shows us how to use the sewing machine to attach strings of beads onto quilts to give them a little something extra. 1604: Color it Beautifully - Learn how to highlight the dimension of designs after stitching by applying color with Nysha Oren Nelson. Watch and learn as Desiree Habicht blends and layers colors with colored pencils. Then, see how Julia C. Wood prepares hexagon motifs for hand and machine appliqué. 1605: The Artistic Touch - First, see how Enid Gjelten Weichselbaum creates reusable silkscreens with organza and iron-on vinyl. Next, Cecile Whatman demonstrates a multitude of techniques while making background fabric for an art quilt with non-traditional media. 1606: Fabric and Fabrication - Watch Lesley Riley as she infuses her personality into fragment fabric collages. Then, Pat Pauly shares ways to design compositions for fiber art, including small-scale sketches, collage, and montage. 1607: Make it Special - Mark Lipinski shares a variety of legacy quilts, along with his own, to show how to leave a bit of yourself behind. See how Tammie Bowser makes fusible appliqué “Jazz Quilts” from photos. Then, learn how to take your quilts beyond the ordinary when Susan Brubaker Knapp offers tips for machine stitching tiny motifs. 1608: Paint it! Cecile Whatman explains the ins and outs of building a painted surface with depth and movement. Then, Desiree Habicht shows how versatile acrylic paint on fiber can be by improving and accentuating details with paint. 1609: Grab Bag - Enid Gjelten Weichselbaum shows how to use stickers and textile paint to add text to her quilts. Next, Rebekah Meier shares her Confetti Zipper Bag which is a great way to use up special threads, yarns, and fabric bits. Finally, Jane LaFazio makes hand-felted soaps for lovely and useful gifts. 1610: Hot Stuff - Joan Shay shows how to make a gorgeous 3-D butterfly using fusible appliqué. Then, learn how to create fabulous textural effects using heat shrinking thread with Liz Kettle and bold metallic designs using iron-on foils with Susan Brubaker Knapp. 1611: Appliqué Three Ways - First, watch as Sue Spargo appliqués wool and embroiders it to make a beautiful needle case. Then, Becky Campbell demonstrates an innovative method for fusible appliqué. And finally, Susan Brubaker Knapp gives tips for making bias strips for stems and vines. 1612: Repurposing - Learn how to recycle old quilt blocks using surface design techniques with Lynn Krawczyk. See how Trish Bowman creates a beautiful memory quilt with vintage silk neckties. Then, watch as Nysha Oren Nelson alters a wooden box and uses it to display intricately quilted pieces. 1613: Inspired by a Photo - In this episode, discover how two artists use photographs to inspire their artwork. First, Jane LaFazio shows how a photo of a unique plant inspires a series of quilts. Then, Pat Pauly shares ways she uses photos to help jumpstart her abstract designs.